These thumb rockers replace the stock joysticks on your controller. 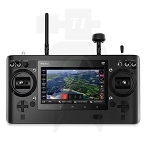 These are compatible with most RC/Drone Controllers . They come in three different colors: Red, Blue, and Black. They are very easy to install; all you have to do is unscrew then old ones and screw in the new ones. That Simple.